I mean do cat have theories of beliefs, desires and intentions of human owners, as we have about other human beings? Your question is very vague. To some degree, cats can read human behavior. But that understanding is limited to what cats understand. The problem here is how we perceive intelligence. For example, my cats had an innate skill in running to the window before I even enter the street when I come home. We couldn't explain it, and while I'm a skeptic at heart, it was hard to debunk my SO's assumption that cats "sense" their owner's presence. As it turns out, at some point they lost the ability to know when I was coming home, which happened when I had the brakes on the car replaced. Presumably, my car was making a high-pitched sound that they could hear. We don't know what a cat thinks. We don't know how it decides to act the way it does. All we can do is distill an assumed logical thought based on multiple observations. Do cats have theories of beliefs, desires and intentions of human owners? As I mentioned the boundaries of your question are very vague. But I'll list some outliers that I have noticed in the cat's I've had. To rescue a cat who had gotten stuck, my father (not a cat lover by any stretch) pulled her by her tail. She fiercely resisted this but he continued anyway. The very same day, she urinated on his bed pillow. A few years later, he stomped on her tail (intentionally). The same day, again cat urine on his bed pillow. Other than these two cases, she was perfectly housebroken and never urinated anywhere but the litter box. I don't mind cats coming to ask for my attention when I'm at the computer, but I dislike them sitting in front of my monitor. I gently nudge them away from the region I don't want them to sit in, and only pet them when they are next to the monitor. All three cats have very quickly learned this and will no longer sit in front of the monitor (but still walk in front of it though). Similarly, I have told them off for walking on my keyboard, and they've quickly learned to not touch my keyboard again. We have a food maze to give our cats dry food. The last few pieces are very hard to get out (that's the point of the maze, to limit them eating it all, unless they're really hungry). When the maze is completely empty, you know that they're very hungry. The interesting part is that they have learned to push the empty maze into the door opening so that we see it in the morning and give them more dry food. It only happens whenever the maze actually empties (e.g. we forgot to add more the night before). We eat dinner in front of the TV off of small white tables. The rule of the house has always been that cats get immediately told off for touching the white table (regardless of whether there's food on it). The youngest has figured this out. He now leans over the white table, taking great care to not touch it, and he will blatantly try to reach my food. What's remarkable is that he often shows a guilty conscience when misbehaving (he basically knows he's doing something wrong and will pretend like he wasn't breaking the rules when I approach), yet he openly does this because he seems to know that it technically doesn't break the rule of "no touching the white tables". Comparatively, we have the same rule about the kitchen counter. No touching, you get told off immediately. Whenever I hear him on there (his collar clings against the dishes), by the time I reach the kitchen, he will have jumped off and either hid out of sight or pretended to be eating from his bowl on the ground. I have video footage of him doing this. If I leave the house wearing my indoor slippers, the cats wait for me to return by the window. If I put on my shoes before leaving, they do not wait for me by the window. All of these things are repetitive observations that the cats make. We've done these things so often, that they are able to predict the pattern. Pattern recognition is a skill that extends far beyond humans. We actively use this in order to train animals (including cats), because we game their pattern-seeking behavior. If a certain action (be a good boy, wake up the owners when you're hungry, give the owner some love) often leads to a positive outcome (treats, positive feedback), then the animal will eventually learn the habit of always performing the action. The opposite applies to negative feedback (the animal will get into the habit of avoiding the action that often precedes the negative feedback). All intelligence is based on learning from positive/negative feedback. This includes human intelligence as well. In that sense, cats are no less intelligent than humans (as to how they learn), but they simply don't have the cognitive capacity to learn as much as humans are able to. Not the answer you're looking for? Browse other questions tagged cats behavior psychology or ask your own question. Do cats recognize their family? Perhaps by scent? Have there been cases of cat owners in high rise apartments being legally required to install screen (safety nets) on windows? Why does my cat's meow have no sound? Can dogs have cat allergy? Are abandoned cats or dogs harder to train? Can I use vitamin pills meant for humans in home-cooked meals for my cats? 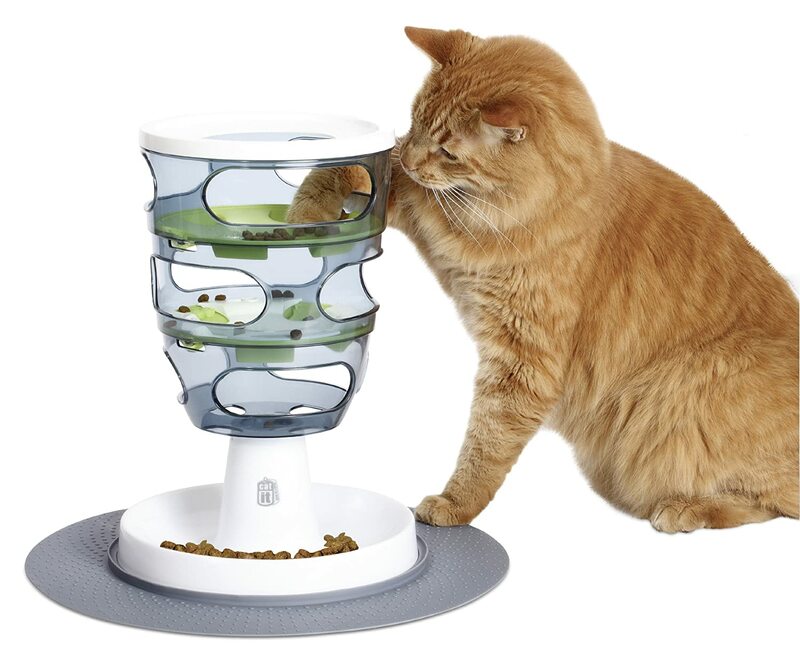 Why do my cats eat food that is not part of their natural palate?